Buffalo Wild Wings (100 S. Main Street, Newark, Delaware location) will donate 20% of your total check (excluding sales tax and tip) to the Newark High School Music Boosters. You must show this voucher at the time of payment. This is not a discount and is not valid for use on discounted purchases or gift cards. You may print a voucher to bring with you or you can download it to your mobile device to show to the cashier. You may not distribute the voucher at the restaurant. ​Print several to give to your family and friends! 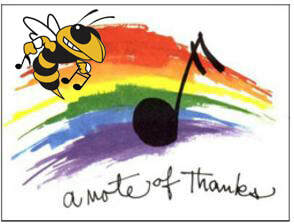 Our heartfelt thanks to you and to Buffalo Wild Wings for supporting our music programs and our student musicians!